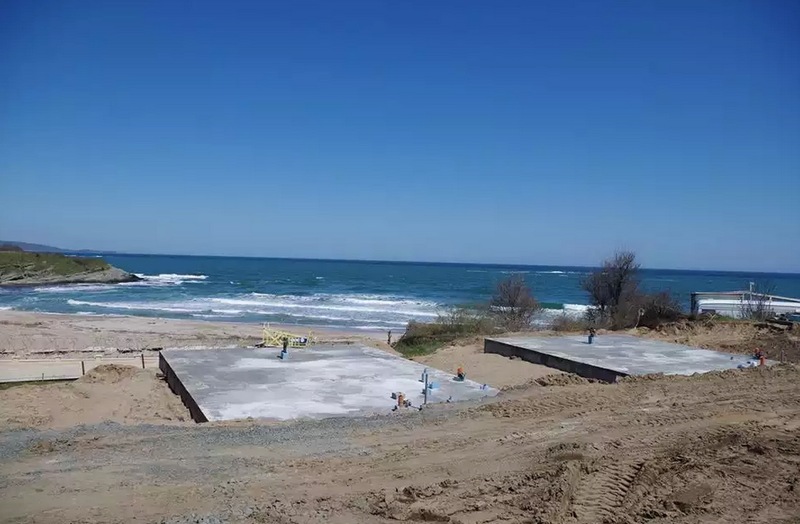 The Skoda distributor for Bulgaria Ivan Todorov, who is now cementing the dunes at camping site “Yug” (South), has serious connections with the “Interbuild” company of Bulgarian drug lord Evelin Banev AKA Brendo that built the five-star holiday village at camping “Oasis”, a check of Bivol showed. Todorov’s company has privatized and resold the land on which the luxurious complex was built. The scheme included the son of Borislav Dionisiev, a former agent of the Communist Secret Services – the State Security (DS) – and the brother of Ivan Drashkov. The company “Aqua Oasis” was established on July 7, 2005. “IF Favorite” with 30%, “Oasis Tour” with 26% and “Interbuild” with 44% are partners in it. Its object of activity is the construction of the water pipeline from the dam “Yasna Polyana” to “Oasis” and its operation. There is nothing suspicious so far here, on the contrary. Respectable investors unite to secure water supply with their own money. But the genesis of this union leads back in time and reveals business activities and property relations on the edge of the law and beyond. The company “Interbild” has been owned by Konstantin Dishliev, shot on May 14, 2005, three months before the founding of “Aqua Oasis”. According to investigators, quoted by the Bulgarian 24 Hours daily, Dishliev was killed for trying to eliminate Evelyn Banev Brendo in the drug trafficking business. Before being named “Interbuild”, the company was called “PfU – Constructions”. It was founded in late 2004 with a loan of 1 million euro taken by Konstantin Dishliev from a Swiss bank, Capital daily wrote in 2007. Dishliev was actually the official owner of “PfU – Constructions” briefly, from January 21, 2005, until his death. Then the company was transferred to the Cypriot “Trapal Holdings”, which in turn is owned by the company “Total Serve Holdings” of the British Virgin Islands, and was renamed “Interbuild”. “Interbuild” is the main investor in the holiday village “Oasis Resort & SPA”, which is believed to have been built with the drug trafficking money of Evelyn Banev Brendo. According to the prosecution that raised unsuccessful charges of money laundering against him, 11,138,650 euro have been invested in it. However, in reality, the luxurious complex with 500 apartments is worth more. And simulated transactions and persons emblematic for the transition period pop up on the path of this money. Let’s start from the present time. Who is cementing now camping site “South”? The properties, on which concrete is currently being poured, have been contributed in kind by “IF Favorite” in the capital of the company “Azuren Bryag” (Azure Shore), established on February 27, 2014, a check of Bivol in the Property Registry revealed. Ivan Todorov and Stamo Stamov are the managers. The majority stake of 52% was recorded by “Auto Bohemia” JSC whose shareholders are Todorov’s “Favorite Hold” and Todorov himself in a personal capacity. The other two shareholders acquired stakes by contributing in kind properties – “Favorite Hold” JSC (14.5%) and “IF Favorite” (33.3%), and they also belong to Ivan Todorov. To trace the ownership of these properties, we must return back to 2002. Then the company “Azure Shore”, which is owned by “Favorite Hold” of Ivan Todorov, contributed in kind to the capital of “IF Favorite” the properties of camping “South” and Camping “Kiten”. A month earlier, the same company contributed in kind properties of camping “Oasis” and camping “Nestinarka” in the capital of “Oasis Tour” Ltd. and “Transpetrol 99” JSC. The exact relationships between these companies are not clear, but it seems that this was some gradual privatization, since at that time the State also had interest in “Azure Shore” through the Ministry of Economy, which held 13% of the capital. The next episode happened in May-June 2004, when the lands in the area of ​​”Oasis” were sold by “Oasis Tour” and “Transpetrol 99” to “Primart Build Engineering”. “Oasis Tour” sold 7 decares for 19,644 levs (2.8 levs per square meter) and “Transpetrol 99” sold 43 acres for 220,000 levs (5 levs per square meter). These amounts are far removed from the actual market prices. At this time, a square meter of land near the beach went for 80-100 euro, thus 50,000 square meters must have cost at least 4 million euro. It seems that these transactions were simulated. Proof of this is the fact that in 2007 the same company – “Transpetrol 99” – bought an apartment from “Interbild” in the vacation complex for 123,520 levs – more than half of the amount it officially received for the waterfront property of 43 decares. The actual amounts of these transactions can be judged indirectly from other information. In September 2004, the company “PfU Construction” of the still-living Konstantin Dishliev was established and loaned to “Primart Build Engineering” 8.072 million levs. Precisely the newly acquired lands were entered as collateral. This amount already corresponded to the real prices. During the described above property dealings, the brother of the former Head of the National Security Services (NSS) and the State Agency for National Security (DANS) Ivan Drashkov – Petar Drashkov – and the son of the notorious in the 90’s big businessman Borislav Dionisiev, founder of Club G-13, appear in the company as partners. Dionisiev is also known as a DS collaborator with the codename “Hristov”. It would be too naive to believe that these seasoned cops were not aware of property prices; of who was behind Dishliev and where his money came from, and it is hardly a pure coincidence that on May 20, 2005, only a week after the shooting of Konstantin Dishliev, “Primart Build Engineering” sold to “Interbuild” the same land with which it has secured a loan of 8 million levs for a price that was ten times lower – 810,362 levs or 16 levs per square meter. Moreover, the status of the land has been changed; it has been removed from the forest fund and “Interbuild” bought properties already in regulation. It is not known whether “Primart” has repaid Brendo’s company the entire loan, but an apparently simulated transaction is lurking here. The real money – several million euro – was given in cash, likely with the purpose “to cut down on taxes” as Chief Prosecutor Sotir Tsatsarov pointed out when explaining the simulative property deals of his own wife. In this context, cutting down on taxes reeks of money laundering from drug trafficking. Anyway, Dishliev’s death had no effect on the business affairs of “Interbuild” which poured huge sums in “Oasis Resort & SPA”. We are talking about tens and even hundreds of millions. The construction was fast and furious and the first luxury apartments were ready for sale in two years. In the end, after all property transactions in combination with Drashkov, Dionisiev and Brendo, Ivan Todorov’s “Oasis Tour” kept a plot on which he built a hotel, right next to Brendo’s vacation village. The bottom line today is that the former State-owned lands of the camping sites “South”, “Oasis” and “Nestinarka” are outrageously built, right next to the sand line, with huge hotels. But apparently that was not enough for the honest investors and the pouring of concrete continues. Only camping “Coral” remains undeveloped so far, not because of lack of interest, but rather because of the rising public opposition. Or maybe because years ago, other players showed interest in it and did not leave it in the privatization scheme of “Azure Shore”. Evelyn Banev Brendo, sentenced to 20 years in prison for drug trafficking in Italy, is missing. According to operational information of Bivol, he is in Mexico, but the authorities are not even looking for him. Deputy Chief Prosecutor Sarafov nervously explained in a recent interview that he could not tell where Brendo was because it was possible that the latter would watch the interview and understand that he has been located. If Brendo wants to know whether he has been located, he should read Bivol, and the prosecutors should do the same. Prosecutors should be nice enough to explain how come he is not in Bulgaria and how he had crossed the border, provided that there is a bail imposed on him? It seems that the government feels strong discomfort when it comes to the drug lord and is losing its composure. As did the registrar of Brendo’s offshore companies – the Head of the Financial Supervision Commission (FSC) Stoyan Mavrodiev, who began hunting the media that wrote about their warm relationship. Could this nervousness be attributed to the fact that Brendo knows all about the cash flows with which he was buying his immunity in Bulgaria? Whether some answers that someone in power is unwilling to be made public could emerge from a detailed investigation in the simulated transactions and cash transfers to companies of Drashkov and Dionisiev, and/or the dealings of Ivan Todorov’s companies? Answers that are missing in the first book of the fugitive drug trafficker and that we will hardly obtain from the second, which he is currently writing.